Sundar Sivasubramanian looks younger than 16, and his bashful smile hides the reality that he’s experienced more sorrow than many his age. Violence and abusive language are common in his home in Mumbai, India’s financial capital and largest city with a population of 21 million in the greater metro area. His mother tried to commit suicide when he was 13. His father was briefly a member of the Seventh-day Adventist Church. In an attempt to give Sundar a new start, his mother sent him to the southern tip of the country to an Adventist boarding academy this school year. Sundar said he has found new hope through prayer at James Memorial Higher Secondary School, where he is attending ninth grade. “I just pray to God that my mother and father can live together happily,” he said in an interview. Just as in other parts of the world, domestic violence is a common issue in India — that vast, ancient land where more than 122 languages and 1,600 dialects are spoken, and multiple faith-traditions are practiced. Sundar witnessed abuse firsthand when his father beat his mother in fits of anger, usually over financial matters. His mother filed for divorce when Sundar was 6, but his father did not sign the papers and instead went off to Dubai to work. When the father returned home three years later, he quit drinking alcohol and began attending an Adventist church at the encouragement of a friend. He was baptized when Sundar was 10. But he later left the church and returned to his childhood faith. He also resumed beating his wife. Unable to cope, Sundar’s mother attempted to kill herself with an overdose of sleeping pills when the boy was 13. His mother ultimately recovered, but Sundar’s grades suffered. He couldn’t concentrate on his studies, he said. So his mother, a non-Adventist who heard about James Memorial from friends, decided to send him to the school in the town of Prakasapuram, located about 1,000 miles (1,600 kilometers) south of their home in Mumbai. James Memorial Higher Secondary School is one of five projects in the Adventist Church’s Southern Asia Division that will receive a portion of the Thirteen Sabbath Offering in third quarter 2017. The school is seeking $260,500 to construct a new girls’ dormitory, with about $258,000 of the amount coming from the Thirteen Sabbath Offering and the rest coming from the division and the local conference. A total of $1.03 million from the Thirteenth Sabbath Offering will be earmarked for the five projects in India. The other four projects include a girls’ dormitory at an Adventist school in Dimapur, located in eastern India near the Myanmar border; 14 new classrooms for the Adventist school in Vellarda in southern India; 14 new classrooms for the Alate Adventist school in Hathkanangle in western India; and the third floor of the division’s first major conference center, situated in the central city of Ibrahimpatnam. 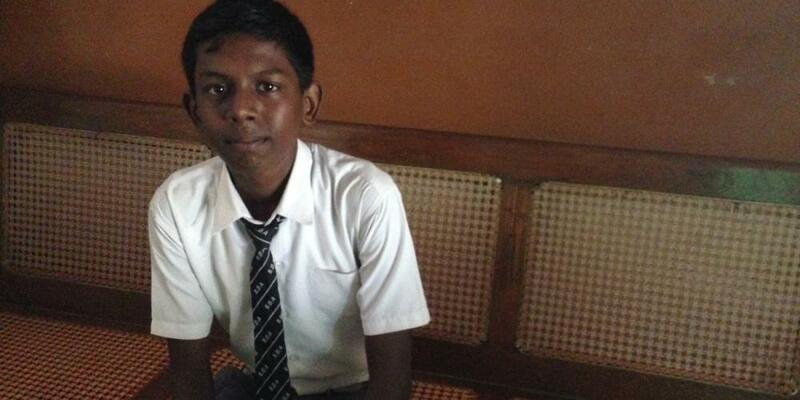 Sundar’s life has changed at James Memorial Higher Secondary School. Teachers said he has started to act like a normal teen. He also has begun to trust in God through prayer. Sundar, smiling shyly, expressed confidence that God would help his parents live together happily. A portion of the Thirteen Sabbath Offering for third quarter 2017 will go toward constructing a new girls’ dormitory at James Memorial Higher Secondary School in Prakasapuram, India. The new two-story dormitory will be able to accommodate more students and will replace the current 65-year-old, dilapidated facility that has only five toilets and five showers for about 100 girls. Southern Malawi. Not the first place you would think of when you consider areas where you can tell people about Jesus. God Found Me Today's program comes to you from the city of Mumbai. When you look at the crowds you ask the question how can the Seventh-day Adventist Church even begin to have an impact in a place like this? We look at that question and others on today's program. January 7 - Making God Known In a multicultural and multiethnic territory, 85-thousand Seventh-day Adventists must find creative ways to approach a growing mindset of secular and postmodern thinking inside the Trans-European region.